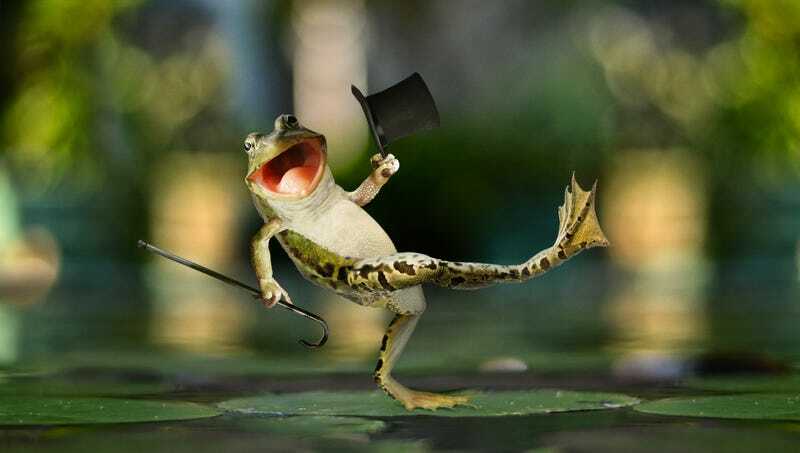 ATHENS, OH—Claiming the finding could shed new light on the diversity of amphibian life, scientists from Ohio University announced Thursday that they had discovered a new species of frog that had evolved the ability to spontaneously grow a top hat and cane. “While in many ways resembling a common bullfrog, Lithobates michiganus is unique for its capability of springing onto its hind legs and dancing with a tiny hat and cane, likely as a way of defending itself from predators,” said lead researcher Masha Rossi, noting that the amphibian’s practice of belting out “I’m Just Wild About Harry” and “Hello! Ma Baby” in a booming baritone was likely a trait developed in order to attract potential mates. “This frog can be identified in the wild by its distinctive green-and-yellow coloration as well as its powerful hind legs adapted for both razzle and dazzle. This amphibian has a truly striking method of locomotion as it boldly sashays from lily pad to lily pad.” Rossi added that this announcement constituted the most significant advancement in the herpetological field since last year’s discovery of a sleepy-eyed tortoise imbued with the extraordinary ability to beat a rabbit in a footrace.